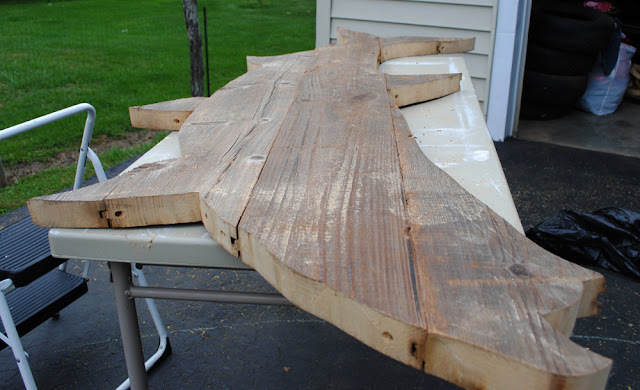 I am not sure yet as to the point of making this large tarpon sign. My awesome neighbor scored this amazing bunch of very old wood (we think it is silo boards) that has incredible texture. This tarpon strikes a much more dynamic pose than the last one I made for my brother's home. At just over 6 feet from the bottom of the jaw to the tip of the tail, I believe this tarpon to possess the correct dimensions of these beautiful fish. Some old motor oil and roughed on paint and she'll soon be ready for whatever her future holds.